Archive for Beating Up Nazis! Well, you know, in light of this little news item, I decided to channel my inner Captain America and see what he thinks of the whole thing. 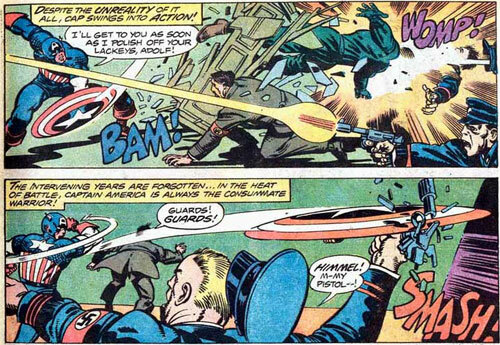 Yes, indeed, real Americans do certainly love to beat up Nazis, don’t they? Friday Night Fights: Evil Wins! 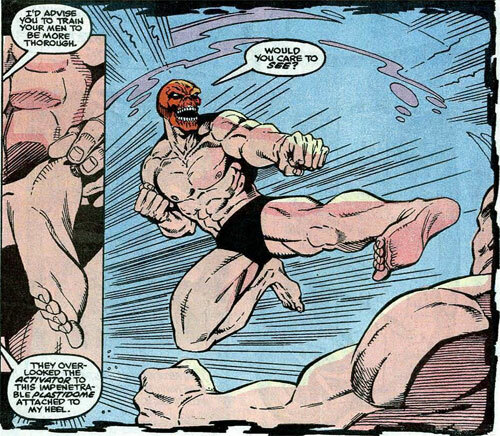 Awright, kids, it’s time for another dose of Friday Night Fights — this week’s fight comes to us from October 1990’s Captain America #378 by Mark Gruenwald, Ron Lim, Danny Bulanadi, and Steve Buccellato. 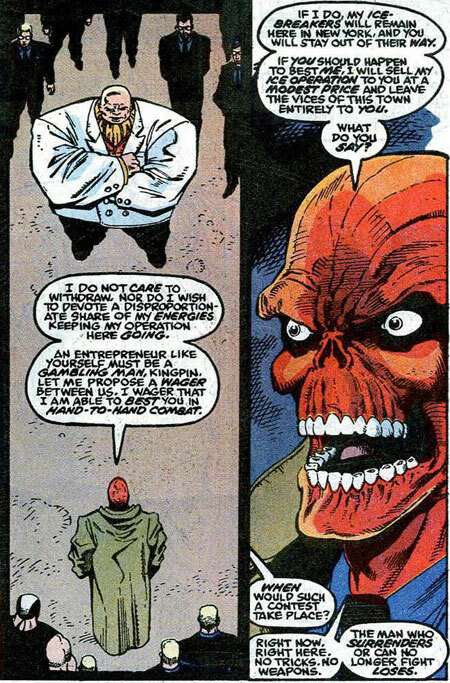 The Red Skull is muscling in on the crime business in New York City. 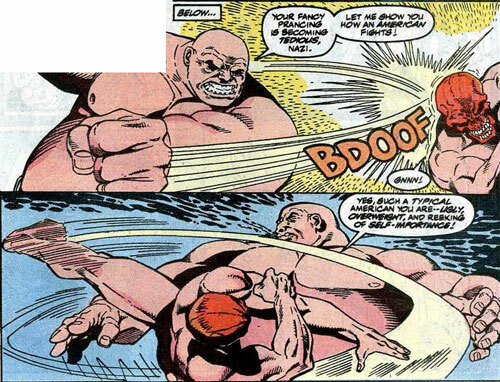 The Kingpin tells him to lay off, and the Skull challenges him to a no weapons fight to determine who takes over the underworld and who leaves town. And to make sure they’re not hiding any weapons, they both strip down to their underwear. 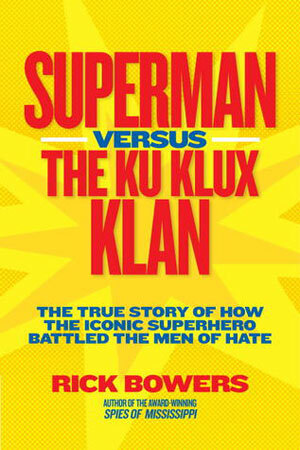 Because apparently, what we comic book fans want is Nazis in their skivvies and fat guys in their skivvies. No wonder the industry is dying. 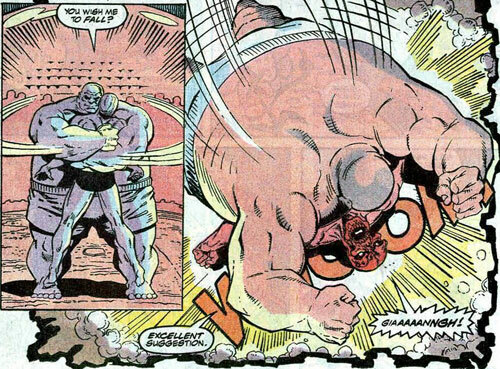 So the bad news is that the Kingpin is a ruthless criminal mastermind, and since he’s won, he’ll continue to make life hell for New York’s superheroes. But the good news is that the Nazi lost, and he lost by being bearhugged and smothered under a sweaty shirtless fat guy — because everyone hates Nazis. 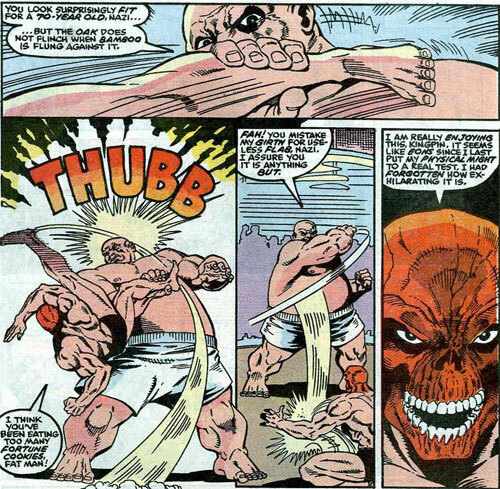 Huzzah for our hero Wilson Fisk! 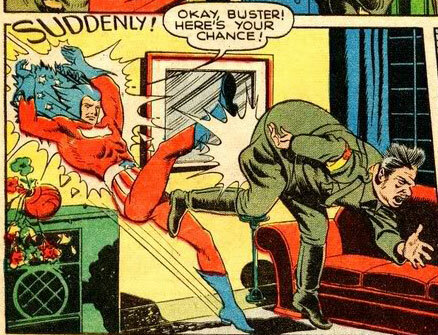 Friday Night Fights: All-American Dictator Punching! Well, now, I hope y’all all enjoyed Independence Day yesterday. I hope you ate hot dogs and safely blew up firecrackers and enjoyed parades and randomly screamed “AMURICAAA!” as we USAnians are, of course, prone to do. 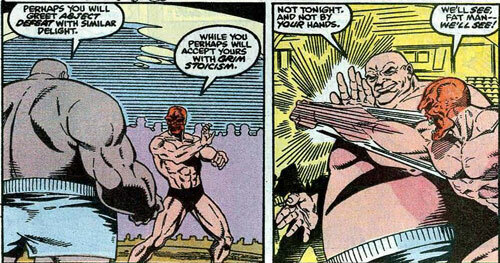 But it doesn’t mean it’s too late to commemorate our national patriotism with a little… FRIDAY NIGHT FIGHTS! 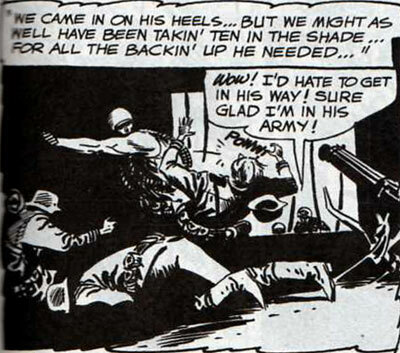 Tonight’s brawl comes to us from October 1941’s Fight Comics #15 by Dan Zolnerowich and an unknown writer. 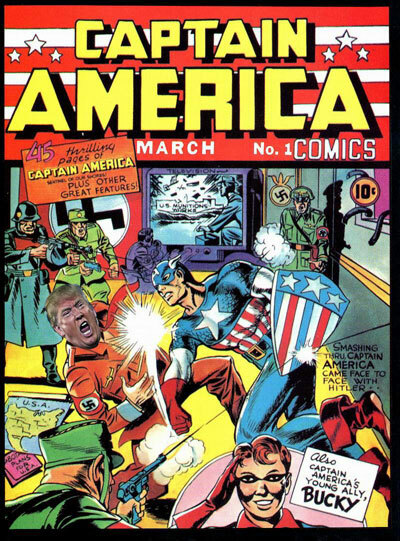 Here’s some cat calling himself Super-American beating up — I don’t know, Hitler? Mussolini? Hitlerlini? Anyway, FIGHTIN’ AHOY. Friday Night Fights: Nothing’s Ever Easy in Easy! 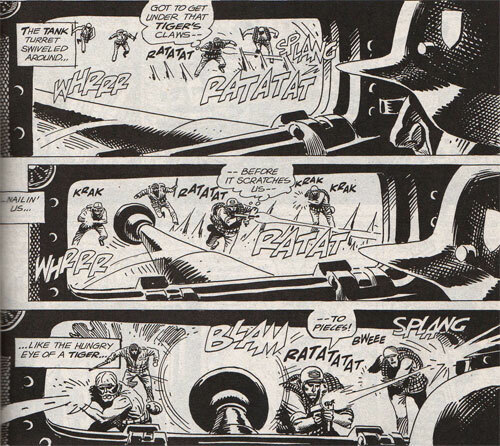 It’s been less than a week since the death of Joe Kubert, and I feel like spotlighting some of his work for this week’s Friday Night Fights. You guys up for it? Then let’s get rolling. 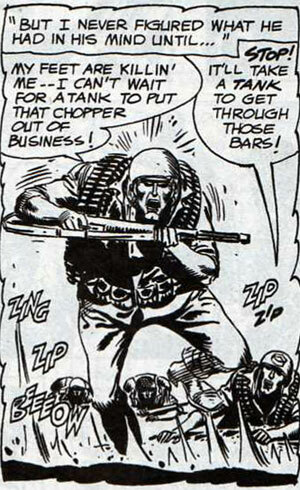 From May 1964’s Our Army at War #142 by Robert Kanigher and Joe Kubert, here’s Sgt. 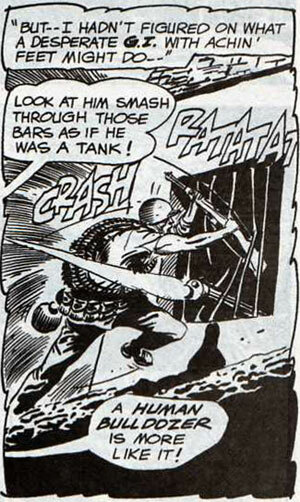 Rock and those Combat-Happy Joes of Easy Company vs. a Tiger tank! Hats off and sound the bugle. Friday Night Fights: Patriotic Pain! Okay, it’s way, way after Independence Day, but some stuff is just too good to pass up. You wouldn’t want me to save this a whole year for next July 4th? No way, we’re doing this right now. Buckle up, kids, it’s time for… FRIDAY NIGHT FIGHTS! 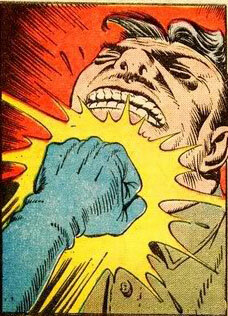 From 1976’s Marvel Treasury Special: Captain America’s Bicentennial Battles #1 by the King himself, Jack Kirby! 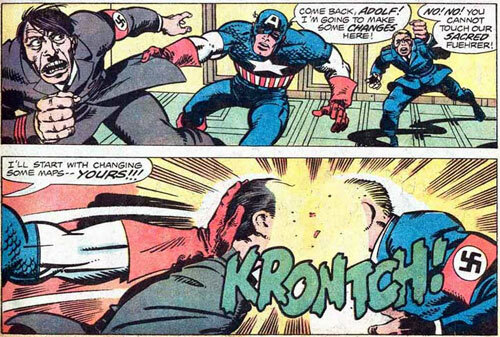 For all the marbles: Captain America vs. Hitler! 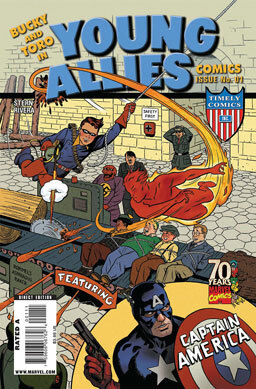 Best way to start the weekend: beating the snot out of Nazis. Friday Night Fights: Memorial Mayhem! It’s not too far past the Fourth of July, is it? I can still shoehorn in some properly patriotic pummelling here, can’t I? Then hold on to your stovepipe hat, ’cause it’s time again for… FRIDAY NIGHT FIGHTS! Today’s battle comes to us from July 2011’s Secret Avengers #13 by Nick Spencer, Scot Eaton, Rick Ketcham, Jaime Mendoza, and Frank G. D’Armata. The scene? 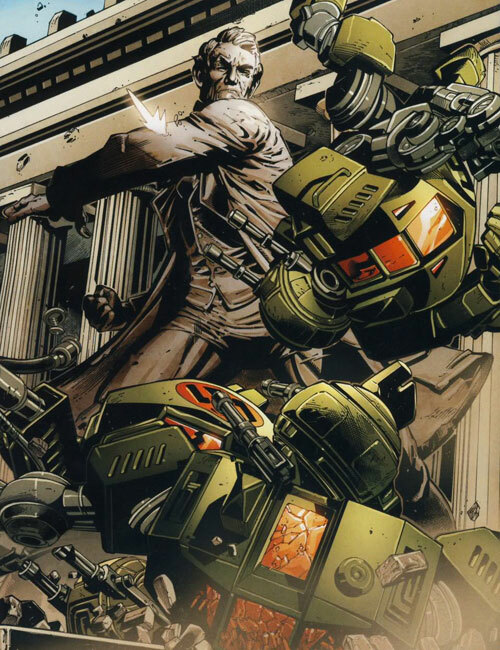 Nazi war machines have invaded Washington, D.C.! And there aren’t enough superheroes around to stop them? Luckily, we don’t need superheroes when we’ve got… THE LINCOLN MEMORIAL! Stand up and salute, citizen! Any country so dedicated to beating up Nazis that it’ll spontaneously animate its memorial statuary is a country that deserves your unending loyalty! Now head over to Spacebooger’s place so you can vote… Vote… VOTE for your favorite battle! Friday Night Fights: Beating up Nazis! Hey, it’s the Friday before the Fourth of July! You know what that means? Yeah, it’s time for WILDLY PATRIOTIC FRIDAY NIGHT FIGHTS! Yeeeeaaaah! USA! USA! USA! Whooooo! Merry pre-Fourth to youse guys, and careful with them firecrackers! There's No Justice. There's Just Zombies. 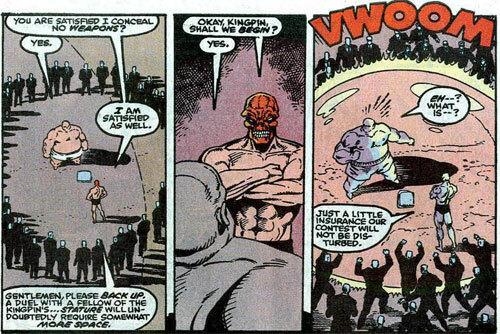 The bad news for everyone is that the Earth-2 Superman’s zombie is up and running again. The good news is… well, there’s not a lot of good news. Mr. 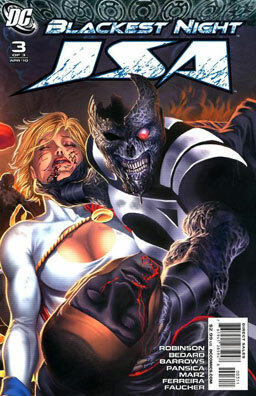 Terrific has a plan to beat the Black Lantern, but it’ll require most of the Justice Society to charge into a hopeless battle against an undead demigod. Is everyone doomed or what? Verdict: Ehh, thumbs down. I don’t mind a big slugfest sometimes, but this one just wasn’t entertaining enough to hold my interest. We’ve got a tale told in flashback from 20 years in the future — Mr. Terrific is in prison and due to be executed soon, so the new Nazi masters of the world want him to record some of his history for their records. 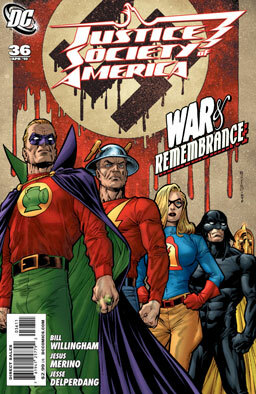 He remembers Liberty Belle getting taken down by a Nazi speedster, Green Lantern getting killed by a bomb in a wooden crate (the Golden Age Green Lantern has a vulnerability to anything made of wood, which is the type of thing that turns a bunch of high-velocity splinters into lethal shrapnel), and the rest of the team has to deal with a large team of evil Nazi supervillains. Verdict: Thumbs up, at least for now. 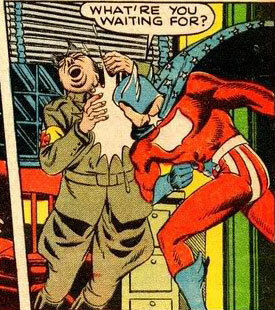 It’s been a while since the JSA had a good time-travel story to deal with, and frankly, it’s always fun to see superheroes stomp Nazis into puddles. Something about the story, however, is bugging me. I can’t really say for sure what the problem is, but it’s making me a bit nervous about how the rest of the story is going to play out. Verdict: Thumbs up. Numerous thumbs up, along with several pinkies and even a couple of big toes. This has got to be the best done-in-one comic I’ve seen in months. The action sequences are fine, but where this story really shines is the small, personal moments, with a trio of old vets sitting around a hospital talking about how their lives turned out, and seeing one of their number through to his final curtain. It’s a beautiful, emotional story, and I hope like heck it wins some awards. 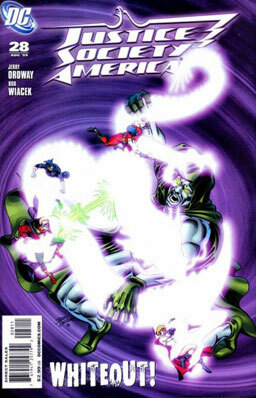 The Spectre takes Power Girl, Atom Smasher, Damage, and Judomaster back into the past to save Green Lantern, Flash, Wildcat, Hourman, and Liberty Belle from the Hiroshima atomic bomb. Kung, a former Japanese assassin who died in the bomb blast, hopes to sacrifice the American heroes to return himself to life, but can anyone stop him and his army of Japanese spirits? Verdict: I’m gonna thumbs-down it. The action sequences are fine, but this just felt too needlessly complicated, on several different levels.